Description: Exploring the ways of thinking and living that the narrative in the Gospel of John would likely have engendered Lindsey M. Trozzo utilizes rhetorical analysis to facilitate a fresh approach to the long-standing �problem� of Johannine ethics. She considers four rhetorical features: participation in genre, incorporation of encomiastic topics, metaleptic extension of those topics, and appropriation of structural devices as guides for interpreting the story's narrative and rhetorical trajectory. Each rhetorical feature is defined and situated in its ancient literary context to provide a theoretical framework for discussion. From there, the author explores the presence of the rhetorical feature in the Fourth Gospel. She finds that Johannine ethics engages the audience in moral deliberation rather than delivering explicit ethical propositions. 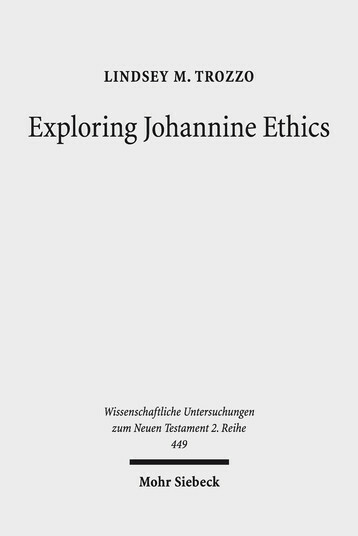 Despite the lack of explicit ethical material in the Fourth Gospel, Exploring Johannine Ethics demonstrates that there is much we can say about John's elusive ethics. Citation: Jo-Ann A. Brant, review of Lindsey M. Trozzo, Exploring Johannine Ethics: A Rhetorical Approach to Moral Efficacy in the Fourth Gospel Narrative, Review of Biblical Literature [http://www.bookreviews.org] (2019).